You embody character traits, experiences, memories, strengths and struggles that no one else does. You walk in the essence of inspiration and passion that others admire from afar. You carry a strength and vigor that seems effortless to others, but you know it requires careful practice. You are the only authentic, real and honest you that has ever walked this earth. And there is so much power in that. If there’s one thing I’ve learned from starting this blog earlier this year, it’s that sharing your authentic expression with the world is not only beautiful but powerful. By choosing vulnerability in weakness, honesty in insecurity, and transparency in imperfection, we give others permission to bravely and authentically live out their purpose. We get to convey an honest and authentic expression of ourselves to the world in order to eradicate the lie that says “You aren’t good enough.” Because most of the lies we believe about ourselves stem from that one statement. But when we know that our worth, value and beauty are inherently ours, we take back our voice. We step into the truth that we are always enough. Whether we are in the deepest, darkest place of our story or the brightest, most beautiful, we are always and forever enough. Because our worth is not dependent upon our failure, shortcomings or insecurity. Our worth is defined by the fact that we are human beings - flawed, yes. But beautifully imperfect. Authenticity is refreshing. The world has enough photoshopped lives. We often make a connection with people because we can relate to them. When we can find a common pain point, we feel as though we can trust that person. If someone appears to be absolutely perfect with no shortcomings or faults, we raise suspicion. We may even feel inferior due to their lack of faults. In the end, we most definitely won’t trust them. In a world where social media is at the forefront and standards are hard to meet, we feel so refreshed by an authentic human being. When someone shares their honest truth with the world - maybe it’s a failure, doubt or an insecurity - then not only can we relate to them, but it gives us permission to be imperfect as well. It’s easy to assume that other people have perfect, effortless and beautiful lives behind the mask of social media. But when people are brave enough to express their imperfections, it propels others to discover this bravery within themselves as well. Related: Is Social Media a Breeding Ground for Comparison? Yeah, it might feel scary at first, but I promise that it will get easier! I never imagined that I would share some of my deepest insecurities over the internet or on my social media accounts. I used to be so afraid of showing my weaknesses (and don’t get me wrong - sometimes I still am). But as I began to open up on this blog and my Instagram account this year, people responded so kindly. Friends, family and even strangers began to express their gratitude for me sharing my honest truth. Because they needed to hear it! As I shared my past struggle with re-touching myself in photos and being insecure about my body and size, people expressed that they were refreshed and inspired by my honesty. To be honest, this blew me away! Yes, some people are going to judge you. But the greater number of people are going to relate to your insecurity, your struggle and your shortcoming. Why? Because there’s thousands of other people who struggle with the same exact thing you do. And guess what? They are waiting for someone else to speak up about it. They are waiting for someone to give them the permission to feel the way they do. They are waiting for someone to have the bravery first so that they can step into their own bravery in return. By sharing your imperfections and struggles, you begin to let go of them and step into bravery and confidence. Not only are you going to inspire, motivate and refresh others by sharing your truth, but you are going to start the process of letting go. You’ll be surprised at how many people reach out to you and share that they have struggled with the same thing you do - and in this process, you realize that you are okay. You realize that your insecurities may be sillier than you think. You realize how amazing, capable and beautiful you actually are. Truth will begin to take power over the lies. Honesty will begin to take power over fabrication. And authenticity will begin to take power over photoshopped realities. Because when we give ourselves permission to be imperfect, when we choose to own our story and when we bravely walk in confidence, lies become darker and truths become brighter. We drown the lie that says we aren’t good enough, and we step into the true identity of who we actually are. This is your life. This is your story - Own it. Share it. The world is waiting for your creative expression, your honest truth, your authentic identity to step forth… to speak up… to stand out. Be bravely confident in your story because every single part of it contributes to who you are in this very moment. Every experience has molded you into the beautiful human being sitting here reading this text. Be inspired. Be courageously bold. And go share your authentic, honest and real story with the world. 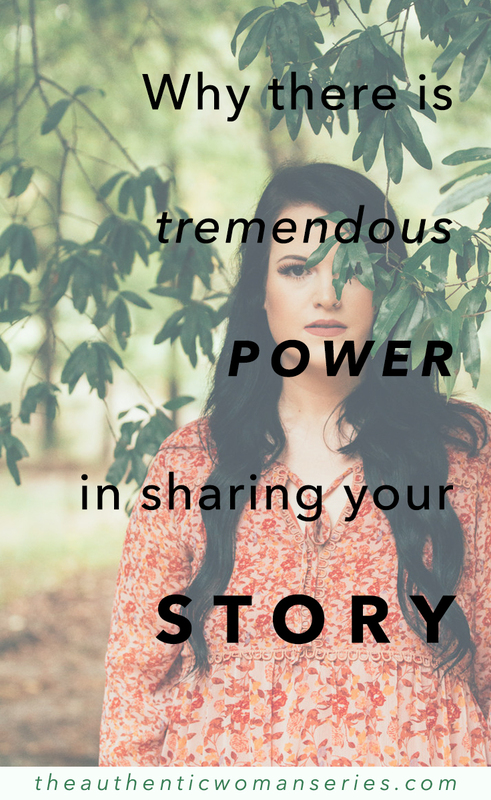 How are you going to share your story today? Leave your answer in the comments below!